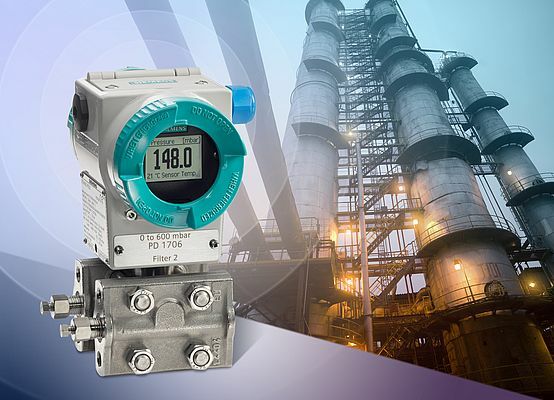 The Sitrans P500 pressure transmitter by Siemens offers an accuracy level of 0.03%, it delivers precise results over the entire measuring range and works with a response speed (T63) of 88ms. Measuring inaccuracies can be minimized by an additional sensor for static pressure, as well as precise temperature compensation. The transmitter offers a level of accuracy that guarantees stable, precise measurements to a turndown of 10:1. This allows versatile use and reduces the need to procure and stock different transmitters. With a long-term stability over 0.05% in five years (0.08% over ten years), the device offers consistently high measuring accuracy, allowing longer calibration intervals. With dimensions of 87x187x139 millimeters, the new transmitter is compact in design and, at 3.3 kilograms, low in weight, and it is especially suitable for applications in the chemicals/petrochemicals, oil & gas, and energy sectors. Thanks to an optimized measuring cell design, the transmitter can also be used for process temperatures of up to 125 degrees Celsius. The precise temperature compensation of the transmitter minimizes measuring inaccuracies resulting from temperature changes. With the new menu-driven setup, local configuration can be done quickly and easily via the magnetic push buttons on the unit. The High Resolution display supports a multilingual plain text menu as well as graphics capability. The transmitter can also be configured using Hart protocol with the help of a quick start wizard.